REALIZACJA ZAMÓWIENIA POWYŻEJ 1000 SZTUK. Anglojęzyczna wersja. Plansz 3D (trójwymiarowa/wypukła). Rozmiar L 54 x 74 cm. This chart is an easy-to-understand overview of high cholesterol and its importance to the health of the body. Illustrates and defines cholesterol. Shows the sources of cholesterol – from food and within the body. Shows and describes the different types of lipoproteins. Defines risk factors and causes of high cholesterol. 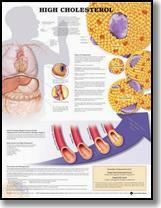 Illustrates the consequences of high cholesterol as plaque builds up within the blood vessels. Also provides prevention and management techniques. PRZED ZŁOŻENIEM ZAMÓWIENIA PROSZĘ O KONTAKT Z BIUREM OBSŁUGI KLIENTA.